Get a great price on the Wismec Luxotic NC from Element Vape. 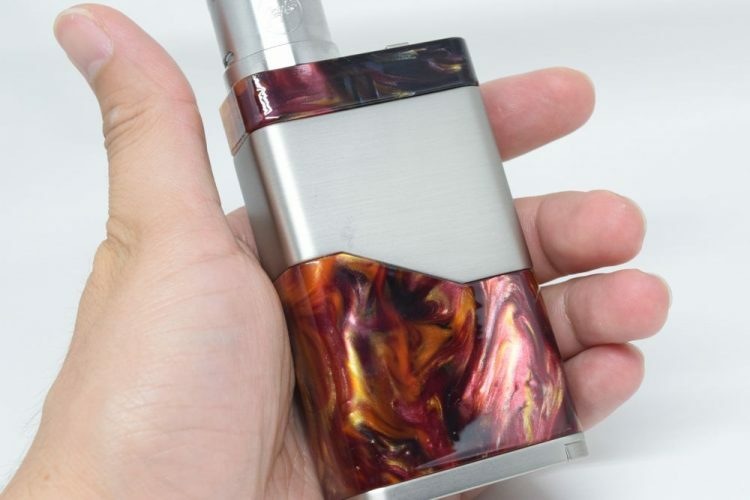 The Wismec Luxotic NC is a chimera of a vaping mod. 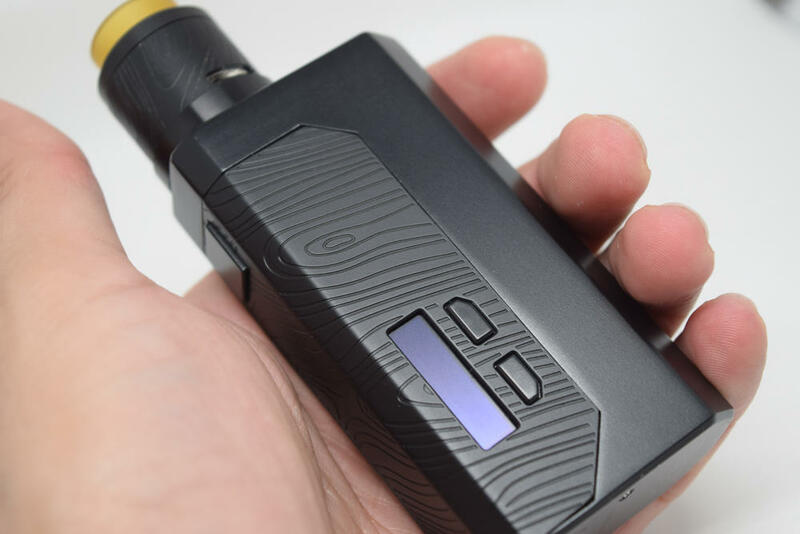 It’s essentially a combination of Wismec’s popular Luxotic BF squonk mod and the company’s Noisy Cricket mod, both very interesting devices with some pretty interesting features. Like the original Luxotic, the Luxotic NC is a pseudo-mechanical vape mod – it works like a mech mod, but has various protections built-in. And just like the Wismec Noisy Cricket, it can be used in parallel or series mode, allowing users to get an output of up to 8V out of the two batteries inside. It’s a very interesting, if somewhat unusual vape mod. Let’s take a closer look at it. The Wismec Luxotic NC (Noisy Cricket) comes in a large plastic case, with the company name at the top and the ‘Luxotic NC’ log at the bottom. The transparent case offers a clear view of the mod inside. On the back of the case, we have a list of kit contents, some technical specifications, as well as company information. 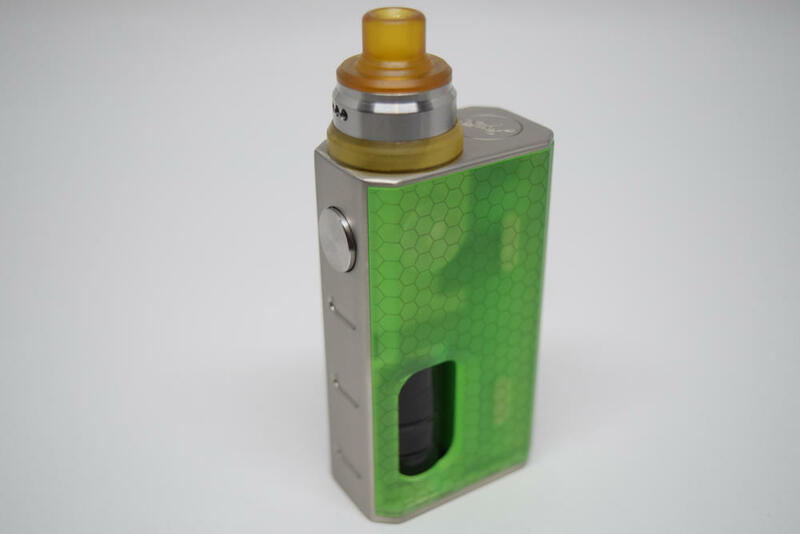 Inside the box,we have the resin and stainless steel mod complete with the Wismec Guillotine V2 RDA sitting in a large Styrofoam holder, and if we take those out, we’ll discover another compartment containing the accessories. We get a very basic user manual for both the mod and the RDA, some organic cotton, a different type of 810 drip tip for the atomizer, as well as spare o-rings, grub screws, a squonk pin, as well an Allen key. 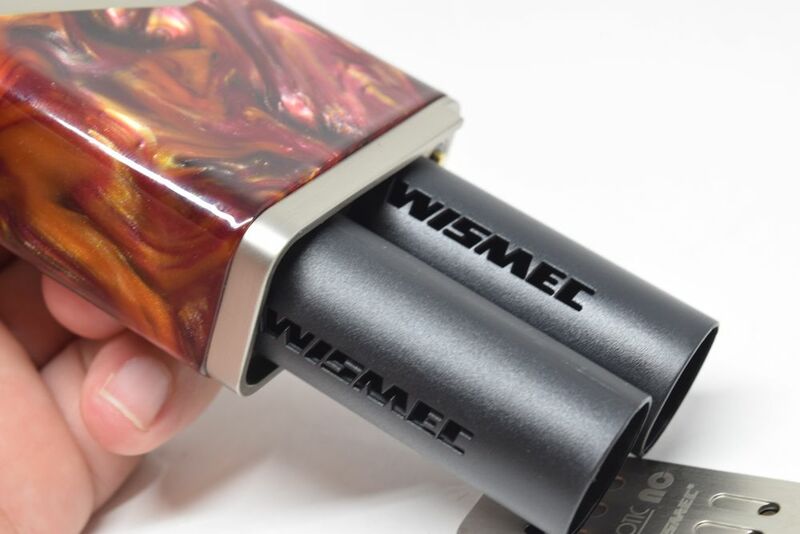 You’ll notice that Wismec didn’t include a micro-USB cable. That’s because this thing doesn’t do on-board battery charging, let alone firmware upgrades. It’s a pseudo-mechanical mod, remember? It doesn’t have a circuit board, so there’s no firmware to upgrade. The Luxotic NC has a very unique look. It is made primarily of resin and stainless steel, so no two are exactly the same. In terms of design , I guess it would be fair to say that it has a classic box mod shape, with rounded edges for improved ergonomics. It measures 96.2mm x 54.5mm x 26.6mm, so it’s pretty big for a dual-battery mod. It’s true that the Luxotic NC is compatible with 20700 batteries, but even so, this thing is a lot taller than my iJoy Captain PD270, for example. If you’re looking for something compact, this is definitely not it. I can’t deny that it is actually pretty comfortable in the hand and that, thanks to the light resin material, it isn’t nearly as heavy as I thought it would be, but it’s still considerably larger than most of my dual-battery vape mods. Starting at the top, we have a classic 510 connection with a spring-loaded, gold-plated pin. Unfortunately, the connection isn’t centered, like on most modern mods. Next to the connection, we have a small LED indictor and a large mechanical switch. It’s by flipping this switch that you can put the mod from parallel mode to series mode, and vice versa. It’s actually quite rigid, so don’t be afraid to put some muscle into it when trying to flip it from one side to the other. 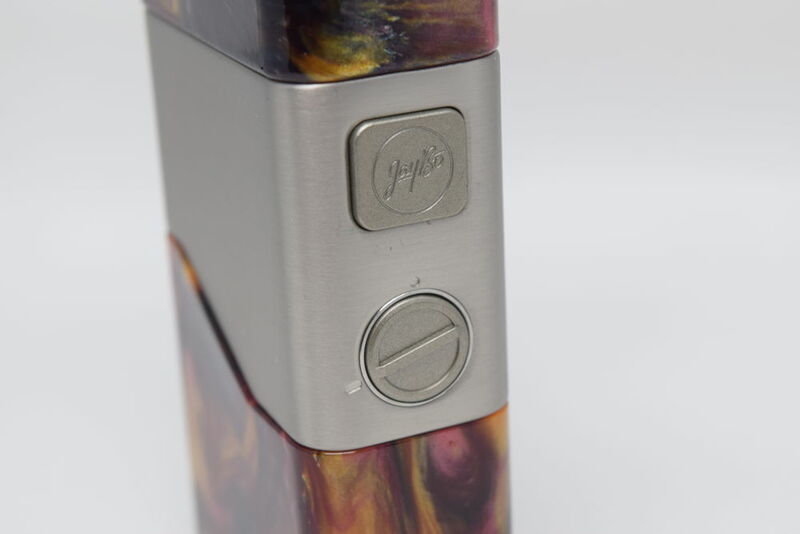 The middle part of the Luxotic NC mod is made of stainless steel, and this is where we find the large fire button with the usual ‘JayBo’ logo etched into it, as well as a voltage regulation switch, or a potentiometer. You just turn this clockwise in series mode and you can crank up the output of the batteries to maximum of over 8 volts. Finally, on the bottom we have a sliding battery door. It’s not my favorite type, because it detaches completely, and a clumsy guy like me will drop it more often than not, but it does slide in and out easily, and it doesn’t rattle at all, which is always a plus. I also like that it has lots of fairly large battery venting slots, just in case something goes wrong. Now, I’m usually a big fan of resin mods. For example, I love my Stentorian Basilisk. It’s not the most advanced mod I’ve ever used, but it is a thing of beauty. 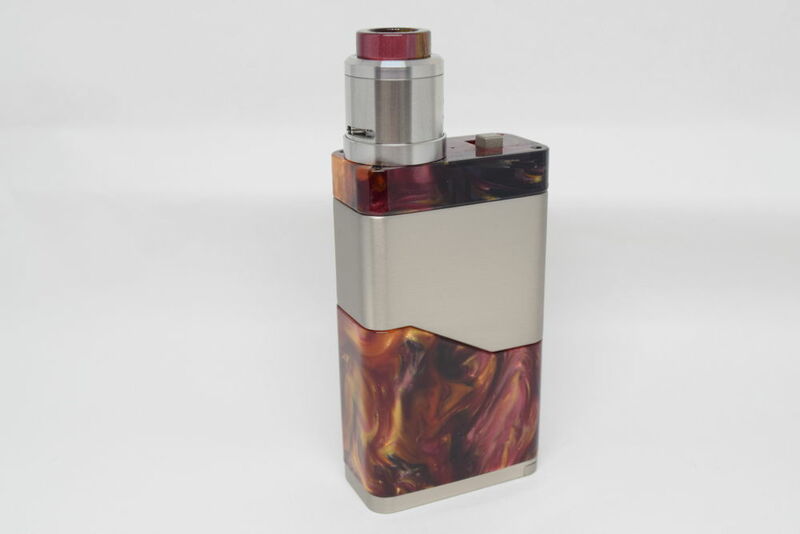 The Luxotic NC is definitely not a bad looking mod, it’s just not as refined. The sample I received for this review has quite a lot of imperfections. The resin at the top is not perfectly even. You can sense that when you run your finger over it, but it’s also visible when light is reflected on it. The lower half of the mod is also slightly uneven and has several small air bubbles. 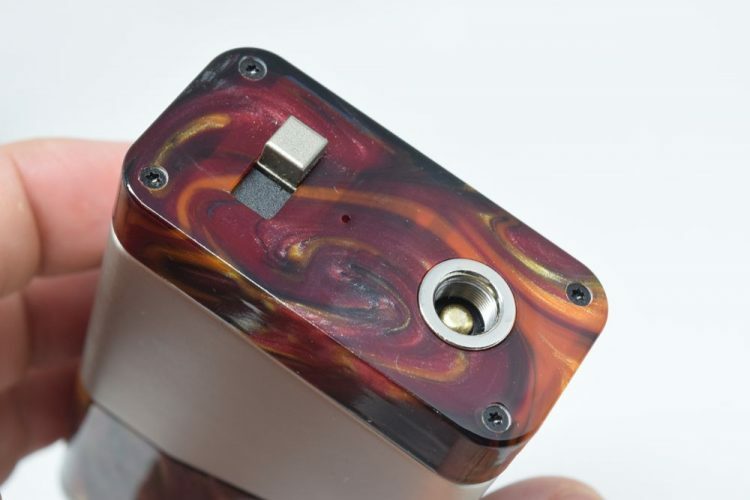 But the thing that mos annoys me is that the lower resin part of the mod is not screwed into the stainless steel part straight. It’s a bit crooked, and again, it is visible but you can also feel it by running your hand on both sides of the mod. It’s a shame, really, because the mod itself looks really cool, but these imperfections are pretty obvious and that just makes me think that production was rushed. Now this could be just my early sample, so don’t take my word for it. Instead, I advise you take a good look at the mod before buying it. There’s nothing to see here folks, this device doesn’t even have a display, so a menu system is out of the question. Same thing in terms of navigation, apart from that switch at the top, which lets you switch between parallel mode and series mode, and the voltage adjustment knob bellow he power button, there’s really nothing else. Oh you can switch the mod on and off by pressing the fire button five times in rapid succession, but I assume you already knew that. The battery life of the Wismec Luxotic NC depends on a number of factors, like what type of batteries you are using – 1865 or 20700 – the capacity of those batteries, what output mode you are in – parallel or series – and, most importantly, the resistance of your coil. This being a pseudo mechanical mod, it will read the resistance of your coil and output the voltage accordingly (in parallel mode). In series mode, you’ll have to play with that voltage adjustment knob to find your sweet spot, but the lower your resistance, the higher you’ll have to set the voltage to get a nice warm vape. Usually, in this section I talk about how good I think a device is, or how well it performed when I tested it, but this is a unique vape mod, so I think I ought to focus more on explaining how it works. The ability to switch between parallel and series battery output really hasn’t been done before, so I think Wismec and JayBo really deserve credit for coming out with something truly original. That said, it can be a bit complicated, especially since the manual doesn’t do a great job of explaining how the mod works, and there aren’t clear markings on the device itself. For example, let’s talk abut that weird switch. It’s what makes this device special, but it doesn’t feature any markings whatsoever. Sure, the user manual clearly mentions that when you switch it to the left, it puts the Luxotic NC in parallel mode, and when the switch is flipped to the right, the mod is in series mode. But people tend to forget things, so why not put simple markings like ‘P’ for parallel and ‘S’ for series, on each side of the switch, just to be sure? The same with the voltage adjustment knob. It just has two dents on the outside of the dial that mark the Minimum and Maximum, but there’s no way to tell which is which. You have to rotate it clockwise to increase the voltage, by the way, but they could have just added ‘Min.’ and ‘Max.’ signs. Anyway, let’s talk about the two modes. When the mod is set to parallel battery output – the small LED near the switch lights up white – it runs just like the original Luxotic pseudo-mechanical mod. This device draws power directly from the batteries, but it has a small chip inside that reads the resistance of your atomizer and applies voltage accordingly, from around 3 volts up to 4.2 volts. You could call it a mechanical mod with built-in protections, because that little chip also cuts off battery power if it detects a short circuit, or in case of battery or mod overheating. Most vapers should use the Wismec Luxotic NC in parallel mode. It’s the safest and simplest option, as it doesn’t involve using that voltage adjustment knob. In fact, the knob isn’t even active in parallel mode, so rotating isn’t going to affect your vaping experience. In series mode, the voltage adjustment knob becomes active, and you are able to set the right voltage for your atomizer resistance. Theoretically, in this mode, the Luxotic NC should be able to output between 1V and 8.4V, in certain circumstances. Wismec even mentions that on their website, but in the user manual, it says that you can only adjust the voltage from 1.3V to 5.3V. I don’t have the equipment to test it myself, but whichever of the two is correct, I find it confusing that they say two very different things on the website and in the manual. 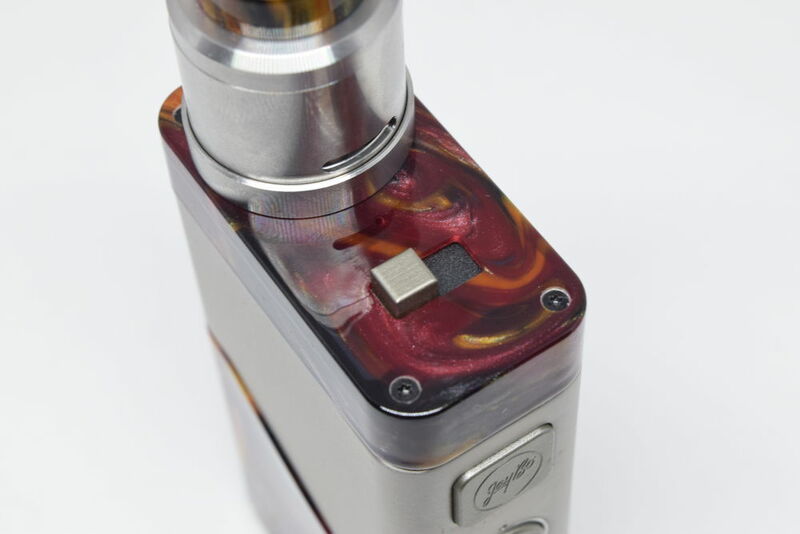 When in series mode, you should set the voltage to minimum and work your way from there, turning the dial clockwise and taking a vape every time to test if you need more power. The lower the resistance of your atomizer, the more power you’re going to need, but if you want to take full advantage of this mod’s capabilities, you’ll want to build around the 0.11Ω – 0.2Ω range. Wismec claims that the Luxotic NC has a theoretical max output of 250W, but in order to hit that level, you’re going need a resistance of just over 0.1Ω and the voltage set to max in series mode. That’s not something I want to experience though, so I can’t tell you if it can actually hit 250W. What I can say is that you’ll need a couple of 20700 batteries to do it, not the usual 18650s. Before using this mod, in either of its two available mods, it’s VERY IMPORTANT to test the resistance of your atomizer. 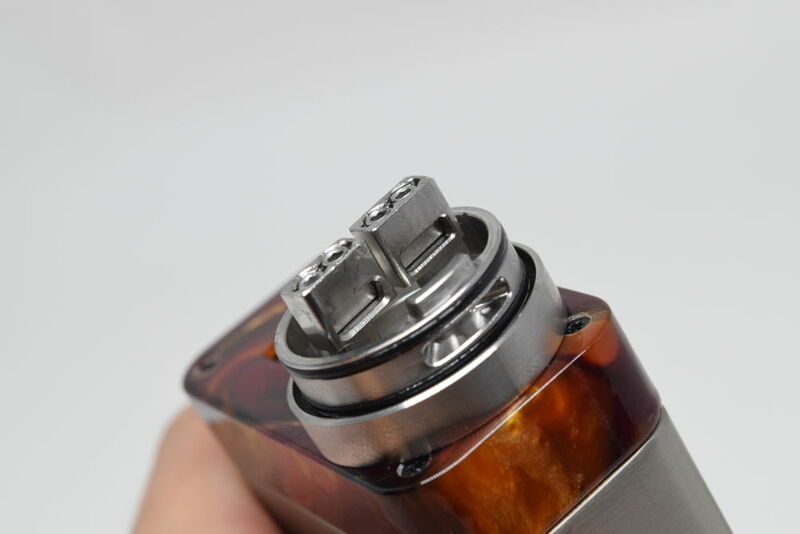 The Luxotic NC only works with resistances over 0.1Ω, so if you want to go below that, you should use another device. Personally, I’ve only been using the Wismec Luxotic NC in parallel mode, as I don’t really need to extreme voltage available in series mode. It’s just not something I find appealing, but I can still appreciate the fact that it’s available, should I ever want to use it. Anyway, in conclusion, the Wismec Luxotic NC is not the most beginner-friendly vape mod on the market – in fact beginners shouldn’t even think about buying something like this – but it works as intended. So if you’ve always dreamed of having a mod that works in both parallel and series battery layout, Wismec has just made your dream a reality. 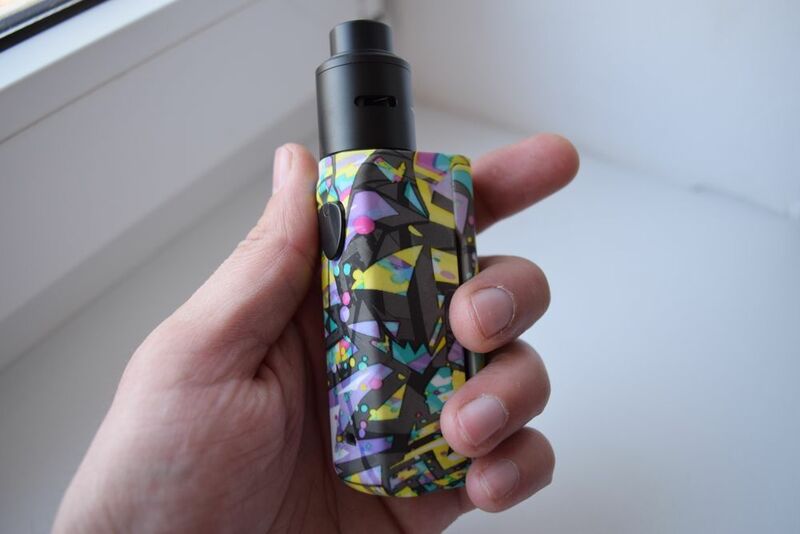 Because it’s paired with such an interesting and unusual vape mod, it’s hard for the Guillotine V2 RDA to shine in this kit, and it’s sort of a shame, because it is a pretty good dripper. 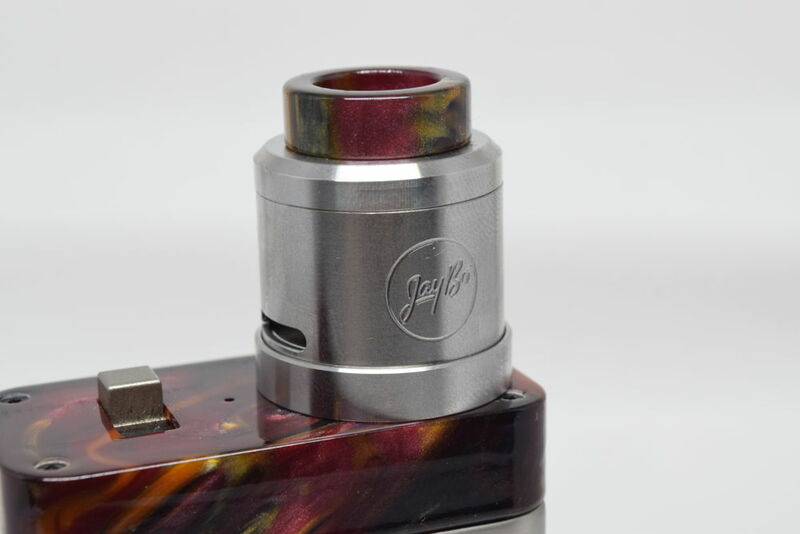 It’s got a very deep juice well, which I love, you can switch between bottom airflow and side airflow by simply flipping the barrel upside down, you have two types of 810 drip tips to choose from, and the two sides of the build deck are connected, so the juice is distributed evenly. Now, building on the Guillotine V2 is not the easiest thing in the world to do. The system Wismec came up with for this atomizer is a bit strange, so it kind of matches the Luxotic NC mod. The two posts use a clamp system to tighten the coil leads in place, but this isn’t like the clamp systems I’m used to. Each post features two grub screw on top, but even if you unscrew all of them, nothing seems to be happening. The clamps don’t drop, they are not pulled up, everything is the same. Well, that’s actually an illusion, as you can actually raise the clamps when inserting the coils through the posts. It’s not the greatest system in the world, to be honest, as if one of the coils accidentally falls out when you’re lining them up, you’re going to have to lift the clamp manually again. I like how they put two screws on each post, to ensure that the pressure is about even on the entire area of the clamp, but, honestly, it;s not the most practical clamp system I’ve ever seen. As I said, the build deck is very deep, and I like how they put the bottom airflow slots higher up, to minimize the risk of leaking, but to make it a non-issue, you can just switch to side airflow, by turning the barrel upside down. That’s also going to turn the ‘JayBo’ logo upside down, but it not a big deal. 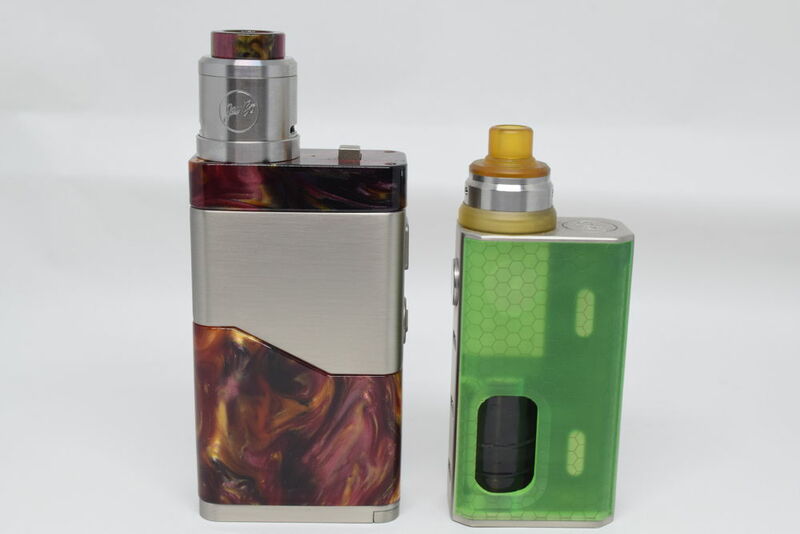 The resin drip tip matches the colors of the Luxotic NC mod that the Guillotine V2 comes with, but if you don’t like this style of stubby 810, there’s a taller one included in the kit as well. Overall, the Wismec Guillotine V2 is a nice RDA, despite its clunky clamp system. It vape great, it’s flexible, and I’m happy to have it in my ever-growing collection. Some would call the Wismec Luxotic NC vape mod special, others would just say its flat-out weird. I’m kind of in-between, to be honest. I like the idea of having to battery layout modes available at the flip of a switch, but I think the implementation could have been a bit better. The output in series mode is a mystery to me at this point and the switch could have used some markings for the two modes. That said, it works, and it this system is bound to get better in the future. So even though the build quality is not as good as it could have been, I’m actually really impressed with what Wismec and JayBo have come up with. If you like trying out new and exciting things when it comes to vaping, you should definitely give the Luxotic NC a try. It’s not for everyone, though. If you’re still getting familiar with Ohm’s law and you don’t really know how voltage and wattage work, you should probably stick to regulated mods. The Wismec Luxotic NC kit was sent to me for the purpose of this review by Vapesourcing. 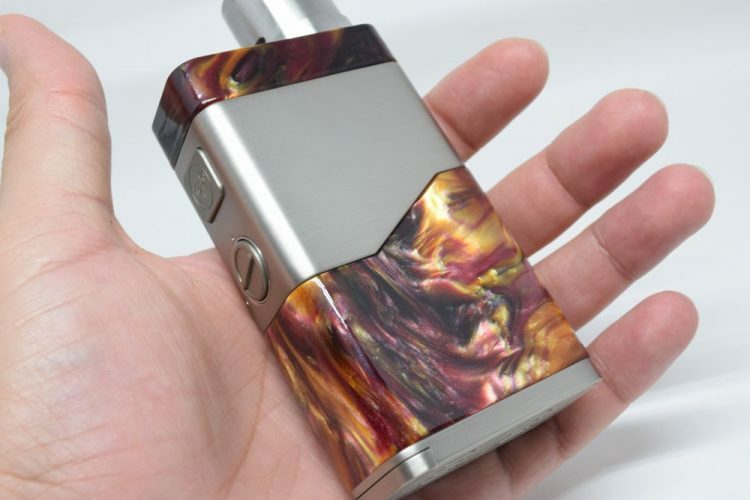 They are currently selling it for $68.00, which is not bad at all considering you also get a nice RDA.